Following the farmer’s instructions, we wound hither and thither across a mostly smooth, albeit bulldust slippery track. We engaged 4WD for some added stability. This kind of driving, enough to be interesting without distracting you too much from the surrounding country doesn’t get old, for either of us. 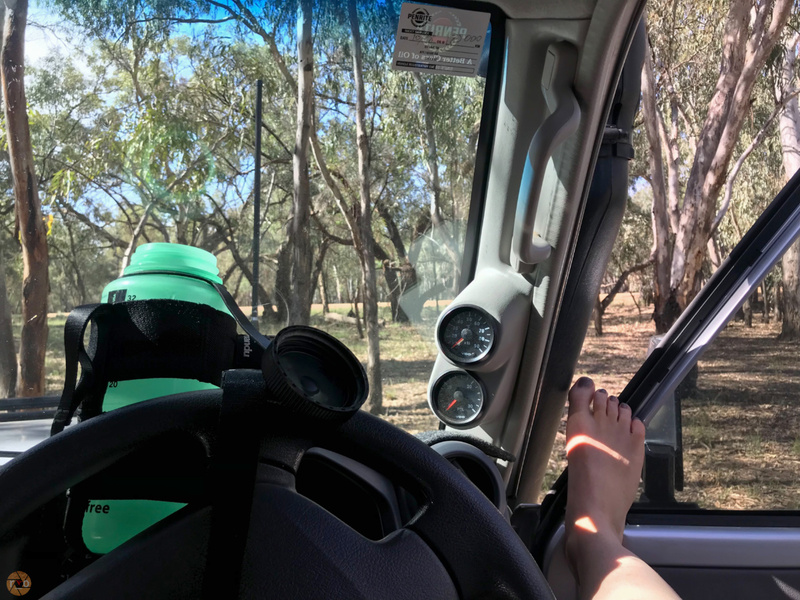 Trying to identify birds through the windscreen, scanning and cataloguing the subtle changes in flora and spotting the natural watercourses or animal trails. 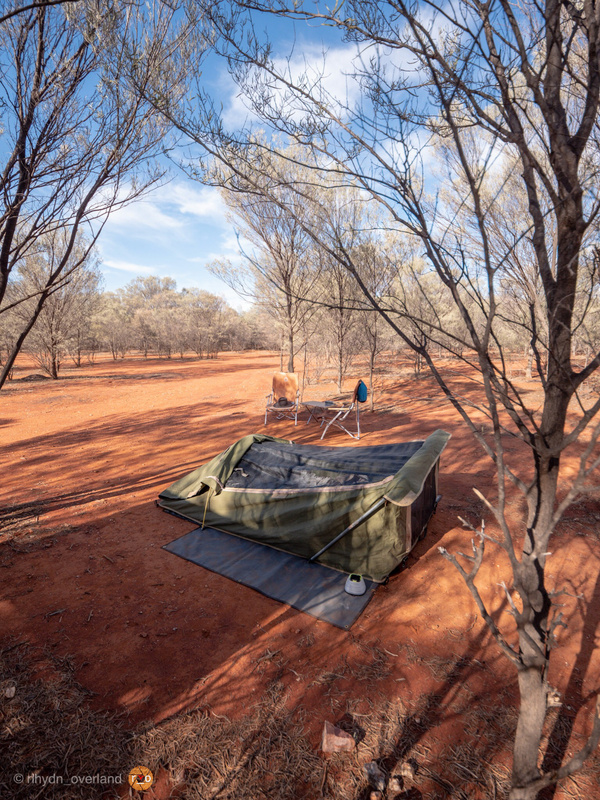 The human element too, small pockets of lopped mulga trees, only two feet tall, and then the crooked fence yonder that they built. A bygone boundary, outliving the wire that binds them, and maybe the bloke that posted them. Finding a tree, I pulled off and we made camp for lunch. It was hot, but the shade was pleasant. David fizzed some cold water and we took a long break to eat our sandwiches. Talking with our mouths full, crunching over loud, dry bark and leaves, bare ankles tickled with scathing grey grasses. 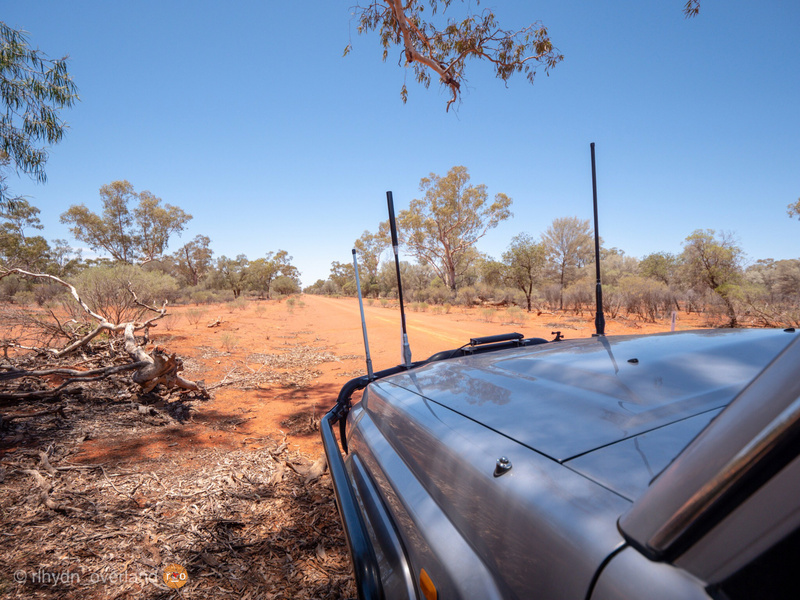 It was only once lunch was consumed, sitting on the rear bar of the LandCruiser, that ,we could listen to the quiet. The area here is sparsely pocked with trees, visibly livestock country. Making our departure, the ceremonial eviction of flies out the window as we gather speed. Occasional brown beer bottles and whitewashed letterboxes interupt the blur of faded green and grey. Eventually, the bulldust changed to a more orange colour. Closer now to the highway, we round on a sprawling station a timeline of buildings, from timber clad to Colorbond. 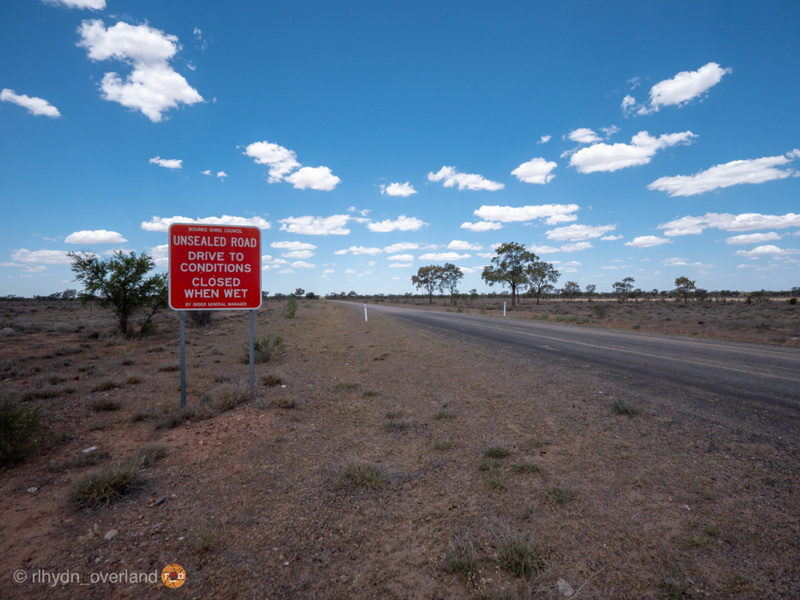 At the bitumen again, we aired up the tyres, we headed to Bourke. 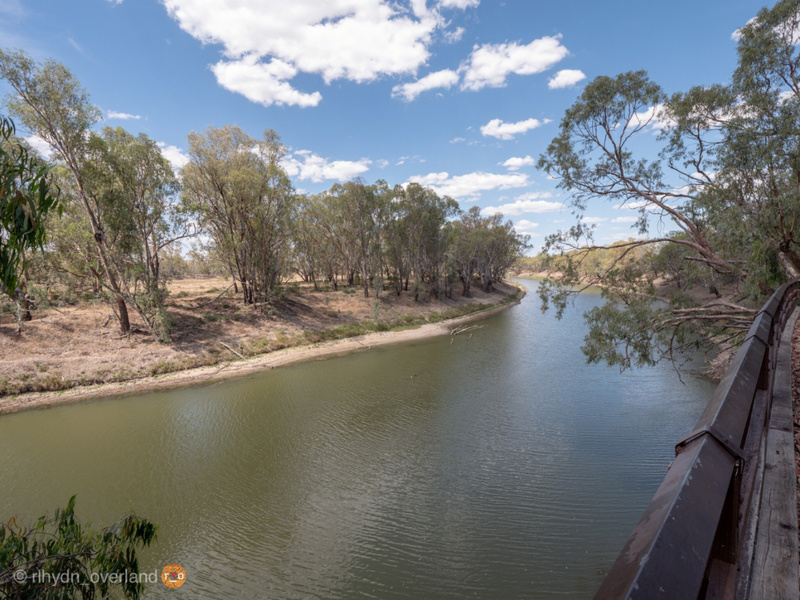 Rolling into Bourke from the North East, its not long before we recognised a riverside cafe we had visited years ago. The lawn is still lush, and there is a sprinkler going, just like last time. We parked in the shade and went inside, our eyes taking a moment to adjust. Ordering ice coffees and baked sweets. My iced coffee took about 20 seconds to inhale, but at least I had the ice cream to chase the chocolate brownie with. I bought some gifts and a postcard and sat outside with the LandCruiser writing my postcard. I gave a local fellow some change for food but other than him, noone else was mad enough to be outside. It was hot. The asphalt reflecting the heat made it more so. I wondered over to the river. The raucous birdlife was cheering. We picked up some bread, bananas and cheese at the IGA. The large back door on the LandCruiser refused to open, no amount of the usual negotiation from me or David would change its mind. That carpark must have been 45 degrees so, we gave up and stashed the cheese in the console fridge. We would deal with the door later. We then drove around looking for a post box before I gave up and ventured into the cool Post Office. Depositing my postcard, we had naught to do but fuel up and leave. 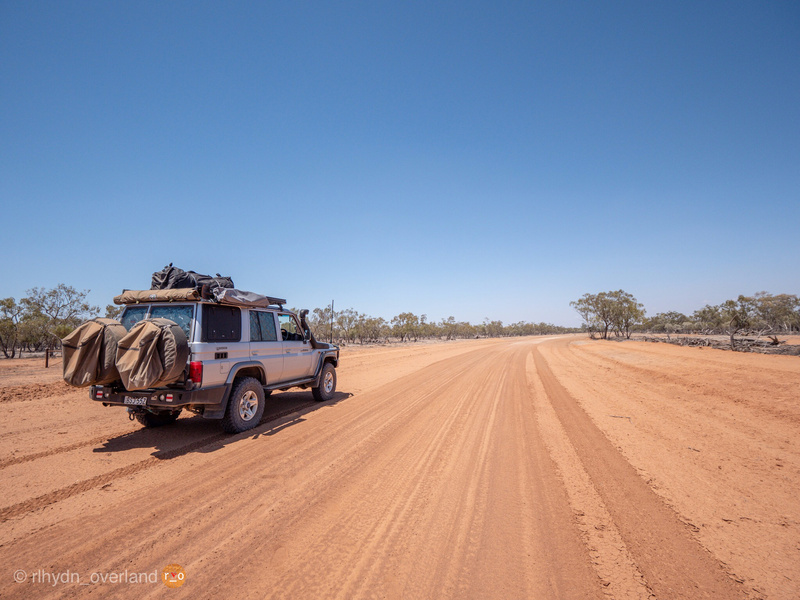 What felt like five minutes down a straight red stained highway, we peeled off toward Gundabooka. Stopping to let some air out, I was grinning ear to ear. Fine and dark red dirt; skin staining, iron rich powdered blood of the continent. Taking photos while David let air out. My hat, inside the LandCruiser. I think I cooked my brain, because it wasn’t long after that I developed a headache. Camp found us quickly, if we had known, we might have found something, somewhere to occupy our afternoon a little more. After lunch, the heat had gained its wings and was soaring. 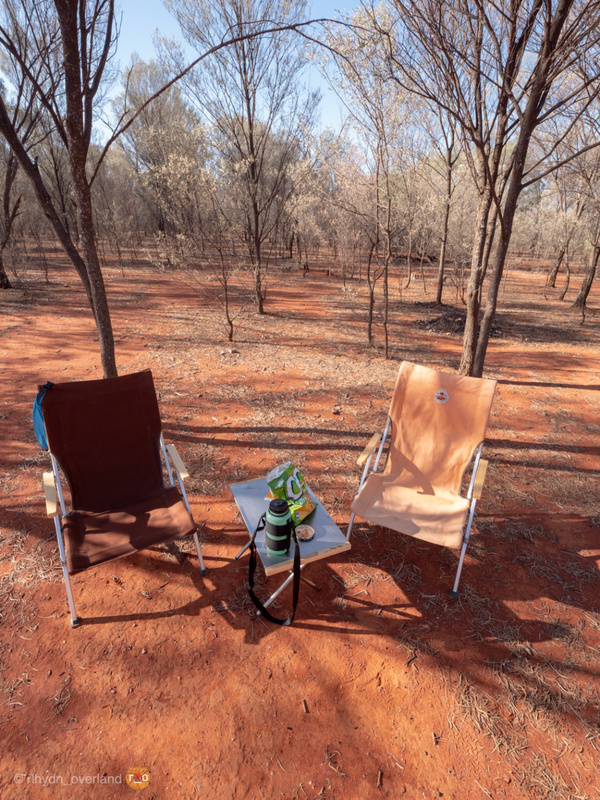 But, arriving to a small clearing in the thicket of mallee, empty and beautiful, we poked the LandCruiser in a shadey pocket and the camp chairs in another. I wandered about, but following the shadows of the trees. I returned to camp and we drank cold fizzy water, and ate hot spicy salsa with corn chips. I played with the zoom lens, from the safety of the shade. And this is how the afternoon was spent – slowly, quiet. A few small birds flitted about, the odd beetle, flies. Only the ants moved with fervour. One, right into my Birkenstock, where in a crushed panic, it stung me. I haven’t been bitten by a bullant since I was twelve, but in about fifteen seconds I was back there. The pain just as memorable. Instead of a finger I wanted to bite off, the arch of my foot felt like I had skewered a star-picket instead. Any fears it was more than an ant bite were quickly abated with the poor bugger, half crushed still in my inappropriate footwear. Only getting up to refresh the cold water supply, we waited until the sun was setting for anything more. As the shadows grew, so did my wandering. But it was still too hot for much more. We watched the sunset from the roof of the LandCruiser. Only once it was properly dark were we feeling hungrier. But not overly so. Sausages and a quick spiced salsa of capsicum, onion and tomato didnt take long on the Biji. 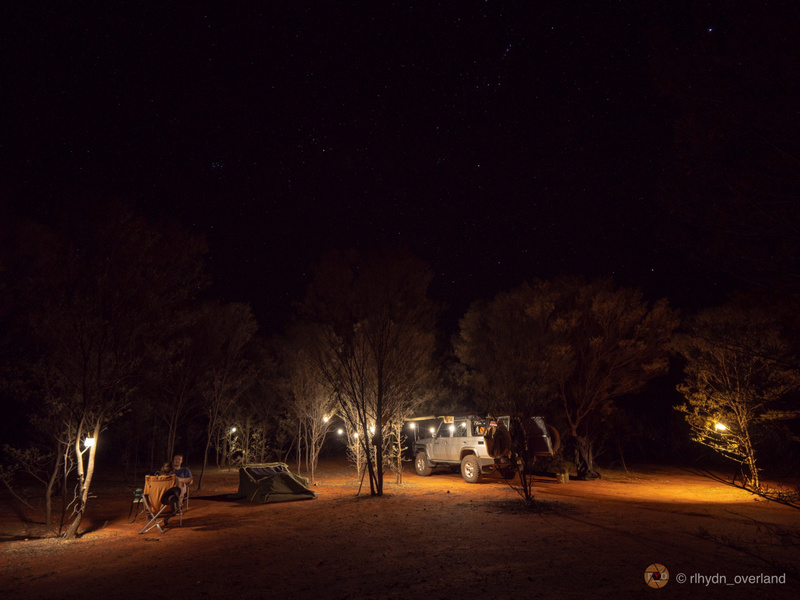 Whilst the stars were visual, it was lacklustre through the lens, so I set about creating our own sparkle. Employing every one of our camping lanterns. 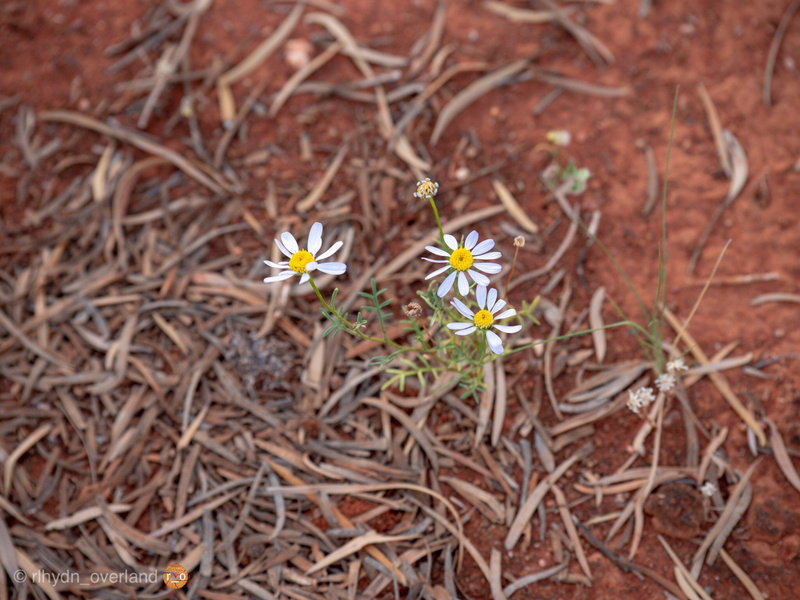 With noone to disturb and even the bugs in short supply, I had our mulga garden party lit to a Christmas standard. Idle chatter under their glow continued, with some music on the Bose speaker. Around 1am we retired. Warmth, not light woke me. Another summer morning. Cool oats and hot coffee for breakfast. We idled about, almost a mirror of yesterdays pace. 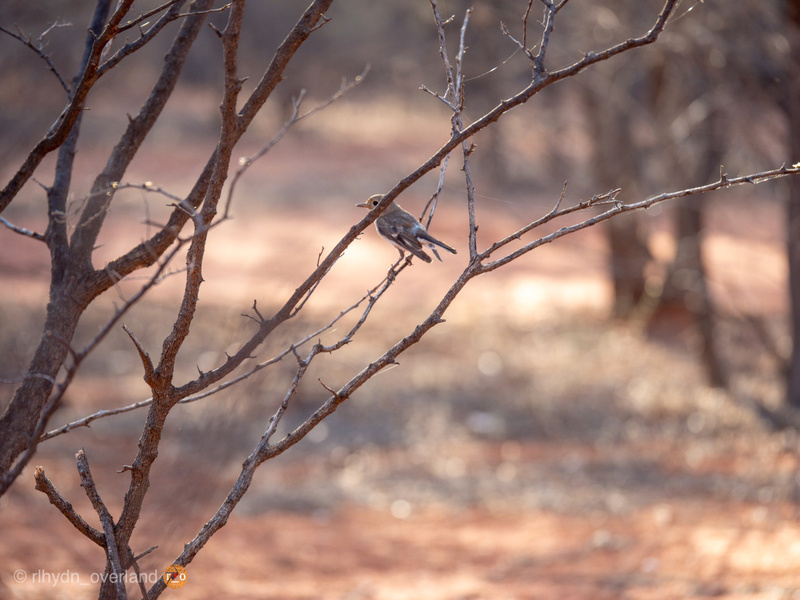 In the low morning light I was able to explore more freely until the top of my head was kissed by the promising sun. Very slowly packing up camp, a last visit to the clean, bee-guarded amenities. We returned to the main road. Continuing west, Ben Lamond is a stunning, wide track. Easy to traverse with a mildly cautionary approach to the bulldust pockets or wet weather scars. 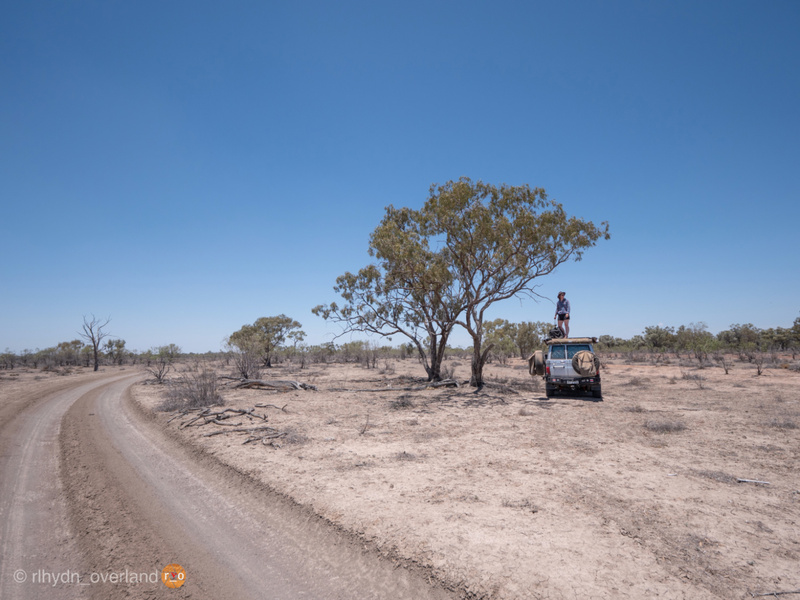 Moloch horridus), but once safely bringing the LandCruiser to a stop and walking back; his tall sprint from the road and into the dry litter of the shoulder had lost him. 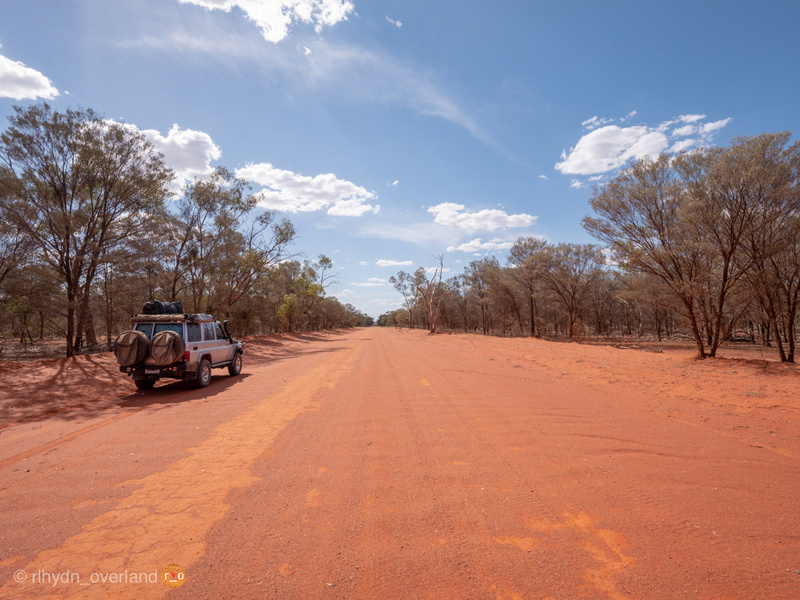 Eventually, we veered left on the Mulgaroon and Wingaroon roads, equally soft with dust but a different hue of red. 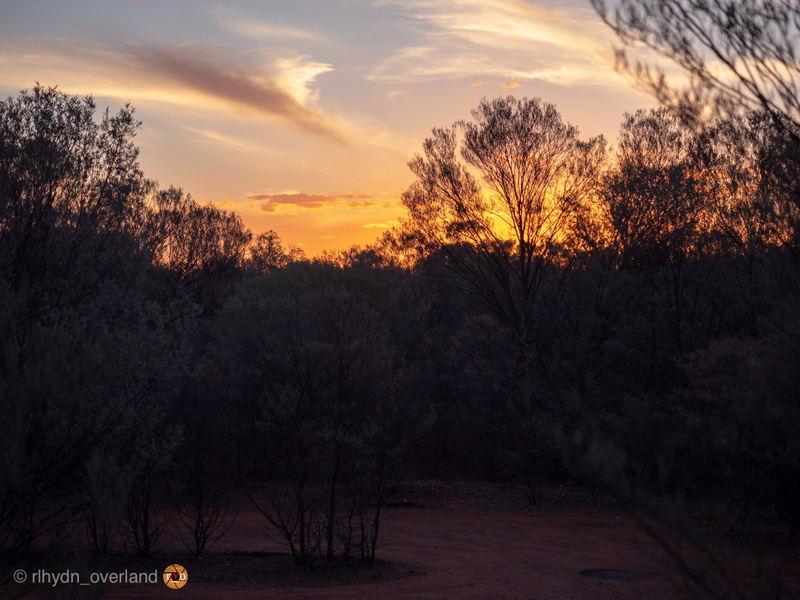 A stunning burnt orange, contrasted with old crackle bark gum trees. The heat shimmer felt a few inches in front of my face. The tempo of the local cicadas was a reverberating slow. We stopped a few times, enjoying the solitude. Thawing out from the chill of the air conditioning. We saw no other people. Airing up where the bitumen found us, our speed increased, but not overly. 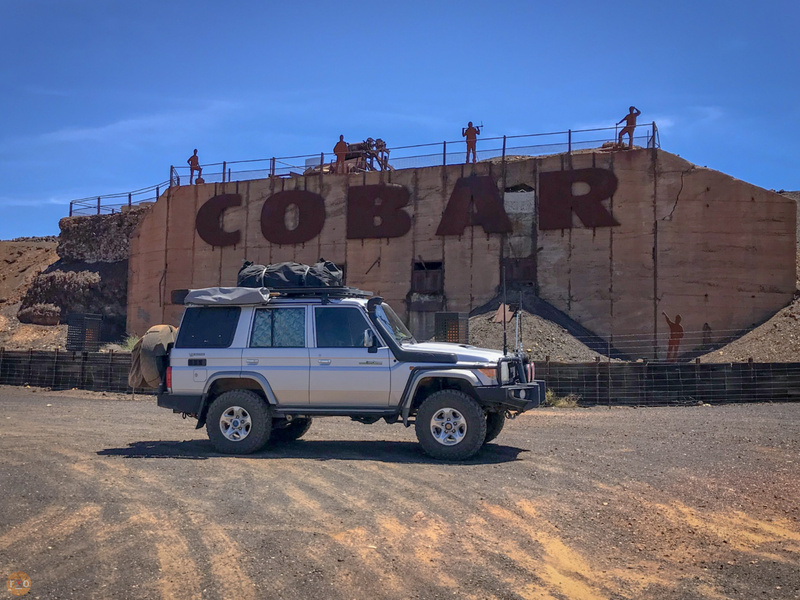 In no particular rush, we rounded on Cobar. Finding the milkbar of a few years ago still open, we gorged on cold salad sandwiches before driving to the lookout. If mining interests you, this one is perched right above. The sign tells of unidentified dwellings from settlement days interested me more, their ruins an architectural and cultural mystery of the European sprawl during the various mining booms. Headed due south, the highway straight. 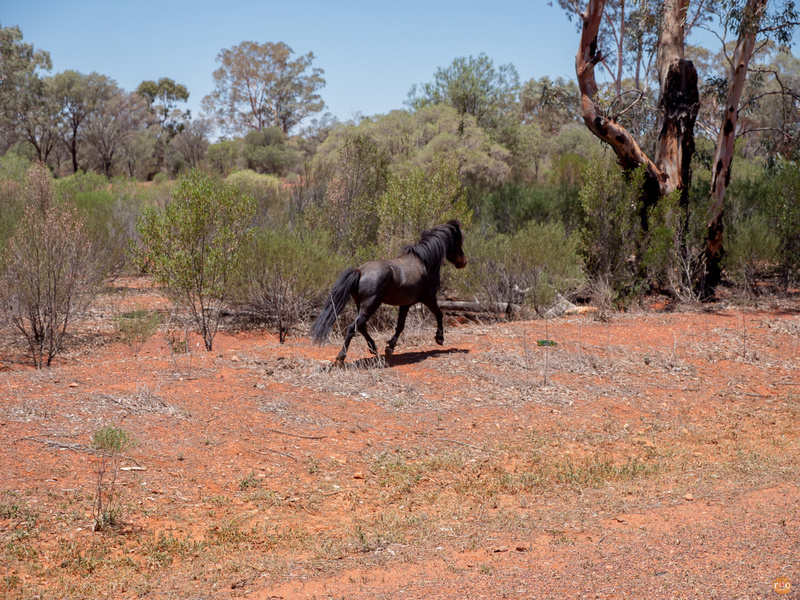 We saw wild ponies, the occasional falcon and kangaroo. 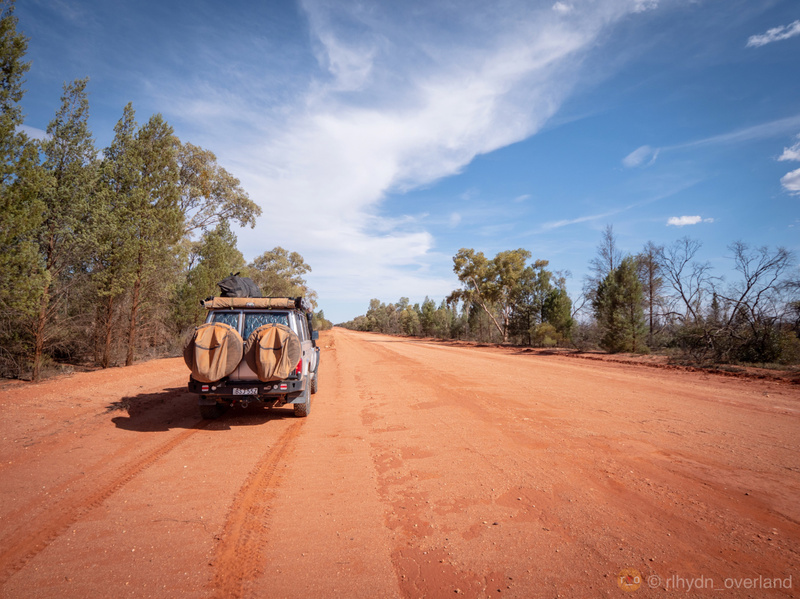 The area was greener, with lush old growth gumtrees shading the red dirt off the road. A few northbound utes flew past. Some waved, most didnt. Mount Hope loomed on the Hema and we blew past the Hotel. At its perch, we saw nothing ahead so we stopped and returned. The mistress of the bar happily poured us shockingly cold Solo and we sat in the shade of the verandah. Watching only three utes go past, one asking after a lost dog from the road. We sipped the softdrink as slowly as we could, savouring the sweet chill and clink of fast melting ice. The short, hot walk to the pepper tree that shaded the LandCruiser was ignored with a belly full of cold soft drink. Poking around some nearby ruins, it wasn’t long before we were blasting the air conditioning and gathering speed. Travelling through logged areas was heart-wrenching. 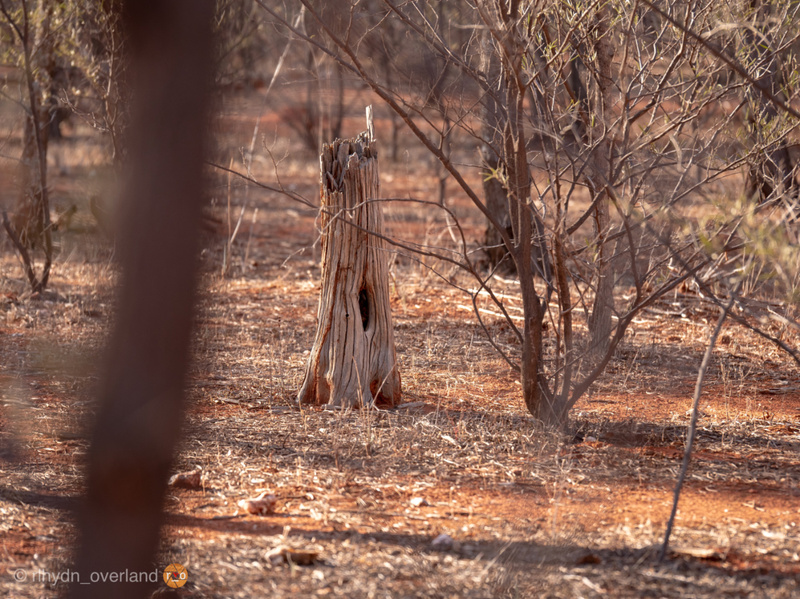 A barren mess of pulled stumps left behind. Were they now en route for toilet paper or garden mulch? 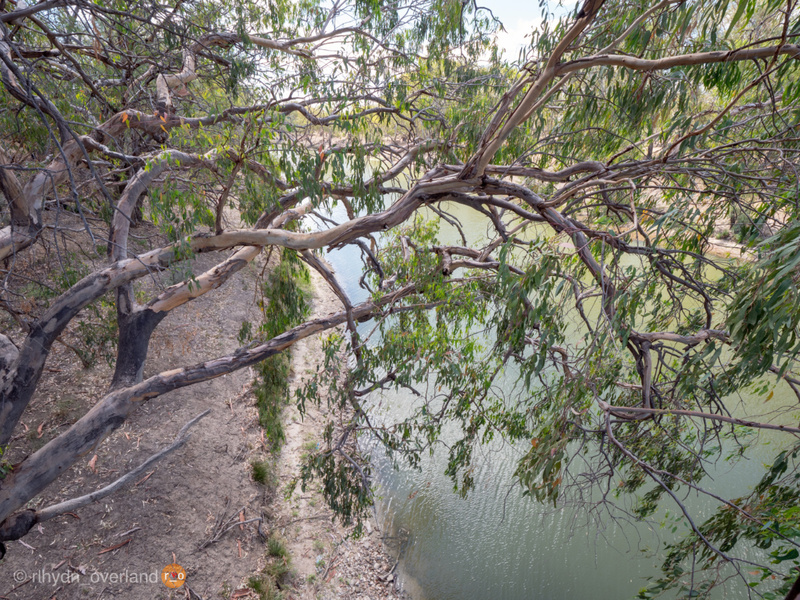 The saddest, skinniest of gumtrees left remaining, so sparsely – these ‘Habitat Trees’ surely are a cruel joke. When a sign loomed with a wide unsealed track off to the right, each side thick with dull green growth, that was my ticket. 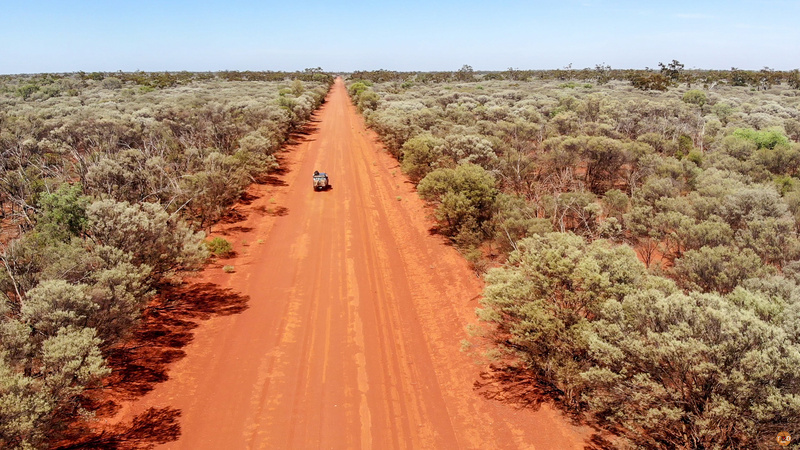 After a few seconds on the corrugations we stopped, aired down and strapped a GoPro on. The heat, nearly knocked me breathless and the gullwings scorched my palms. Before long we were kicking up a proud bulldust tail while I negotiated the shallow ruts from prevous rain. As straight as an arrow, the LandCruiser a silver land rocket in the forty plus degree afternoon. 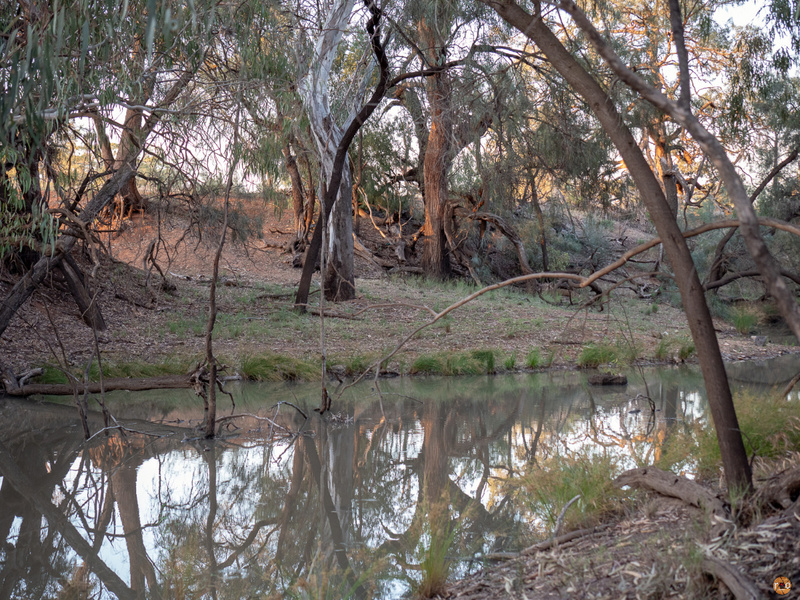 Running out of the Nature Reserve, we stumbled on shaded creek. The level area held a defined entrance and exit of previous vehicles. We poked the LandCruiser into the gloom of shade. I found ruined yabby pots on the bank. We had found a shadey oasis from the sun. The water was slightly cool and trickled past a grey green colour. After soaking my feet and watching water bugs and willy wagtails I used our clothes bag as a bean bag. We sat, listened and chatted about nothing in particular. I was becoming quite relaxed here, under the trees. Feeling lethargic and warm, and not wanting to drive anymore; We decided to stay and unfolded the camp chairs. Sipping cold water, waiting for the evening to cool. It didn’t. In fact the car’s temperature showed us it had risen. Despite our waterfront locale, we were in for another night above forty. A bush mouse seemed awfully interested in first the clothes bag, and then the swag bag, sprinting about in the leaf litter, sounding larger than it was in their crackle. After cold sandwiches for dinner, and rinsing our hair and faces with hot water from the tank. The boiler wasn’t needed. Too tired and hot for anything else, we packed everything up, zipped the swag’s mesh tight and nodded off. Frogs murmouring. Mosquitos buzzing. Neither of us slept as well, and at some point in the early light I had unzipped the swag, and a few ants had invited themselves in. Six legged alarm clocks. Rolling the swag, we were washed and feet up in the front of the LandCruiser. Sipping coffee and listening to the industrious birds. 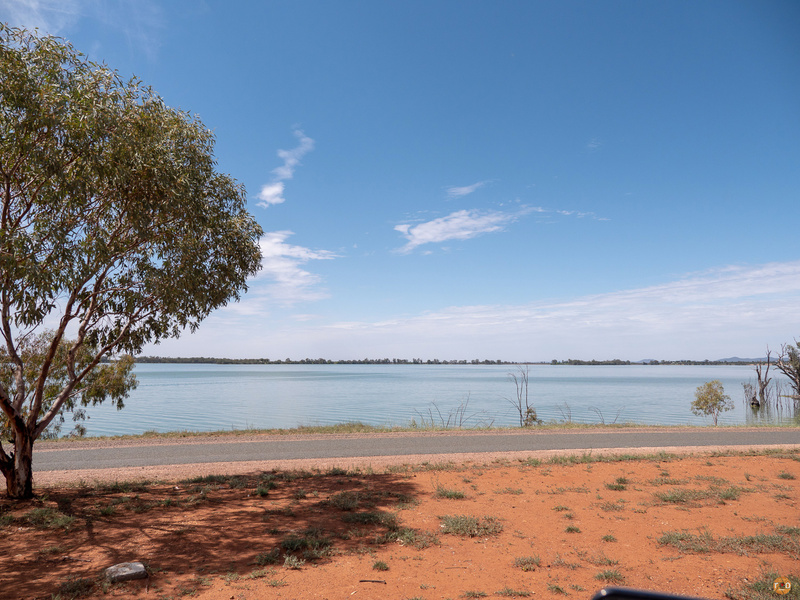 We werent too far from our intended destination of yesterday, Lake Cargelligo. Once arrived, we found the Lakeside camping offered only a small amount of shade, despite the large area. The water was clear and popular. We waded in to our shorts, cooling off. 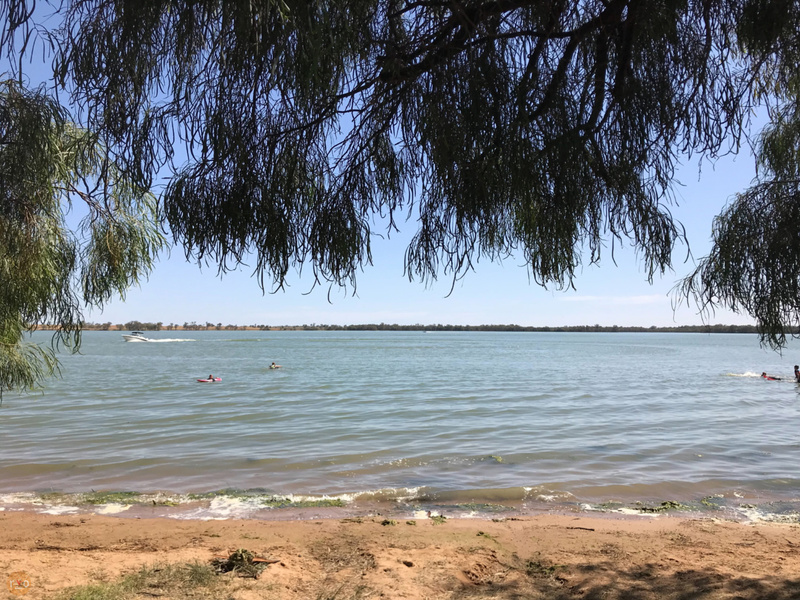 Three other families were already established, chairs and speedboats deployed. The town was all but closed. Sunday. Winding our way along narrow country highways, we were passed by more towed speedboats, the day of rest and play was beginning. We also crawled through towns that were no more than railway sidings. 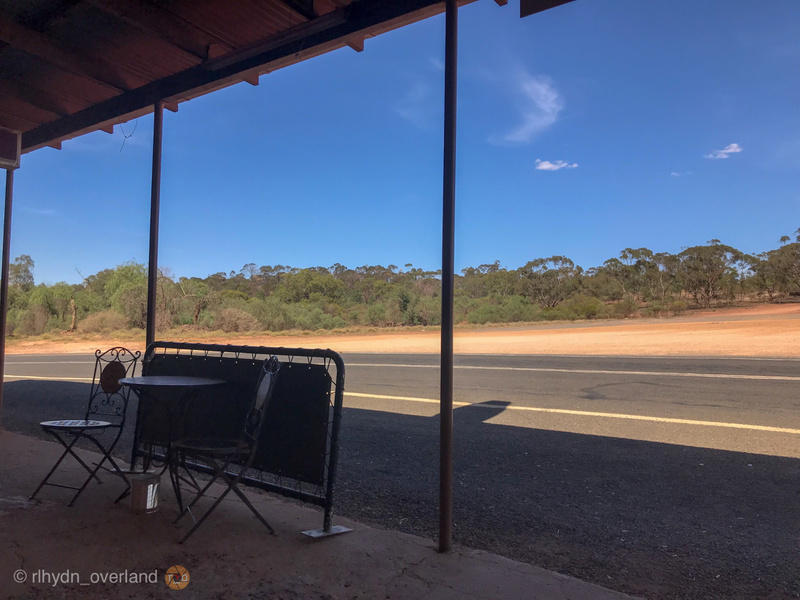 Stopping in West Wyalong for lunch, we were making tarmac time towards home. En route to Grenfell, we flagged the Weddin Mountain National Park for a return visit. 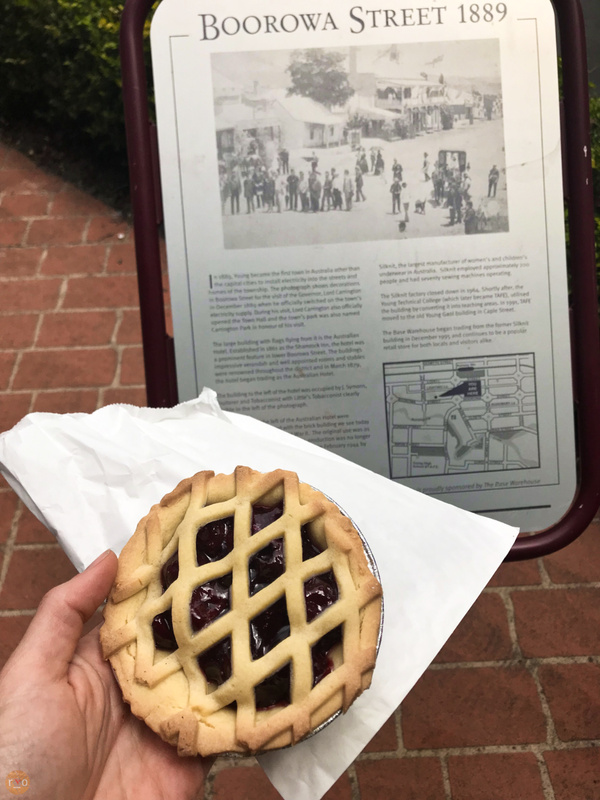 Stopping in Young for cherry pies, we walked the main streets, reading the history plaques at most street corners. 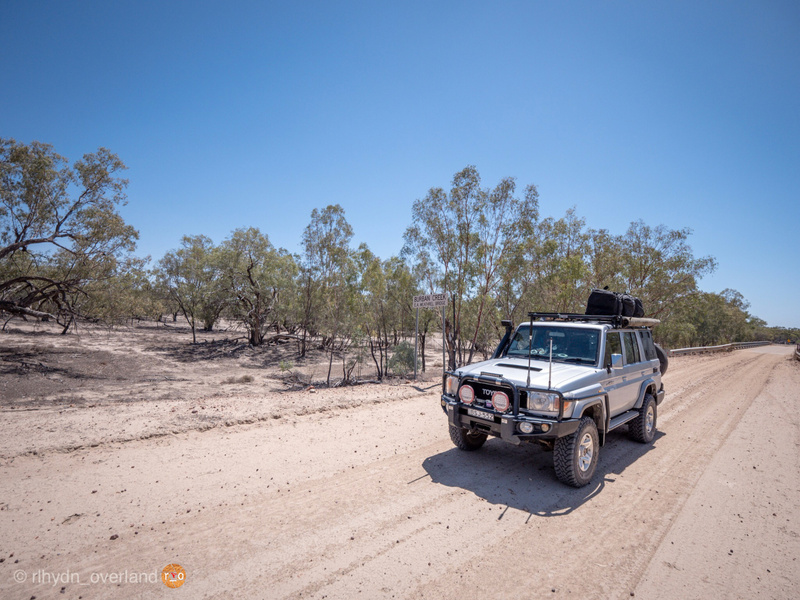 Air conditioning and fizzy water pulled us back to the LandCruiser and we were off again. 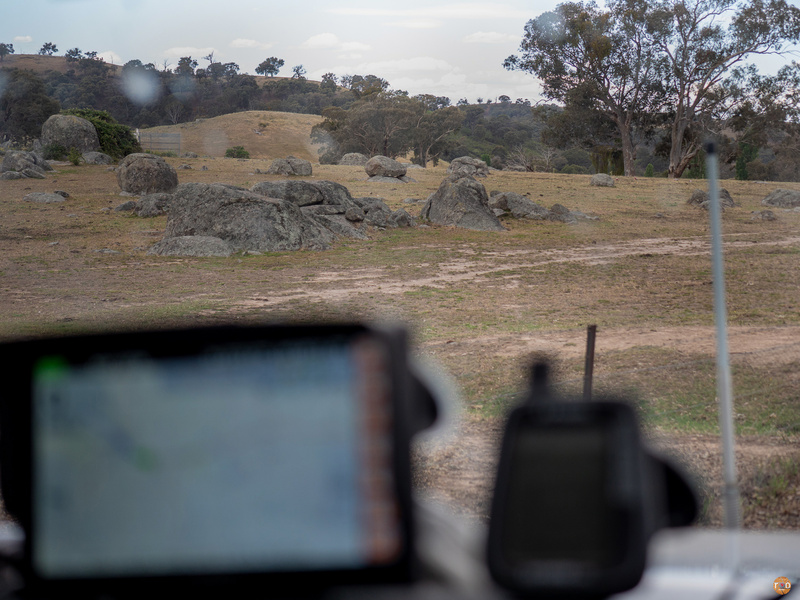 Our wiggly line taking us slowly to Murringo, Boorowa, the boulder riddled countryside of Rugby and Crookwell. 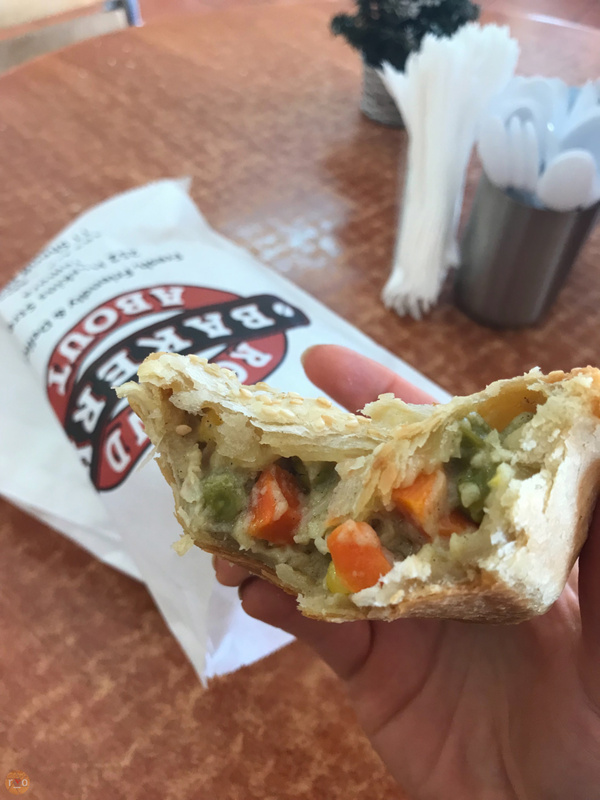 Back in familiar territory it felt like a blink of an eye before the winding country road ran out and we were in Goulburn for dinner. Like many weekends before. 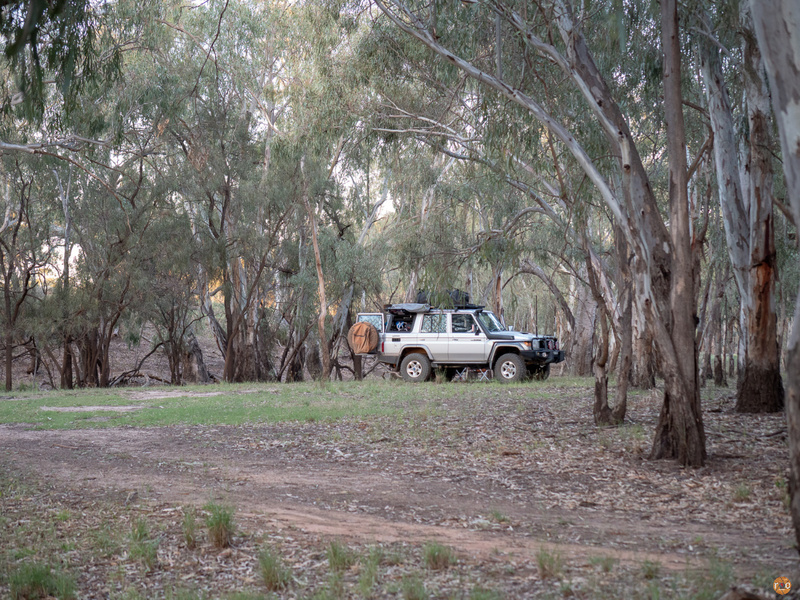 But this time, we, and the LandCruiser were stained red and feeling gloriously sunblinded and tired from a roadtrip. 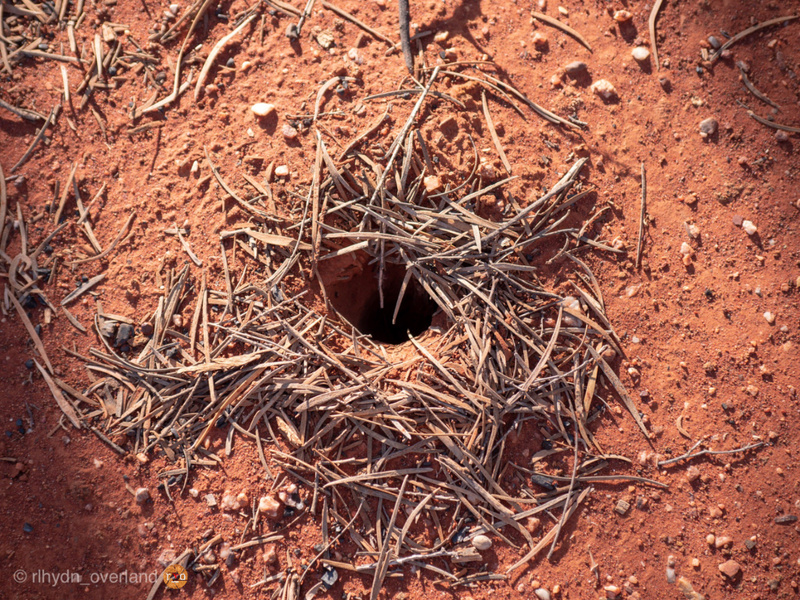 A couple of days ago we were at the drought stricken QLD border, then alone with the bull ants in the red heart of NSW. 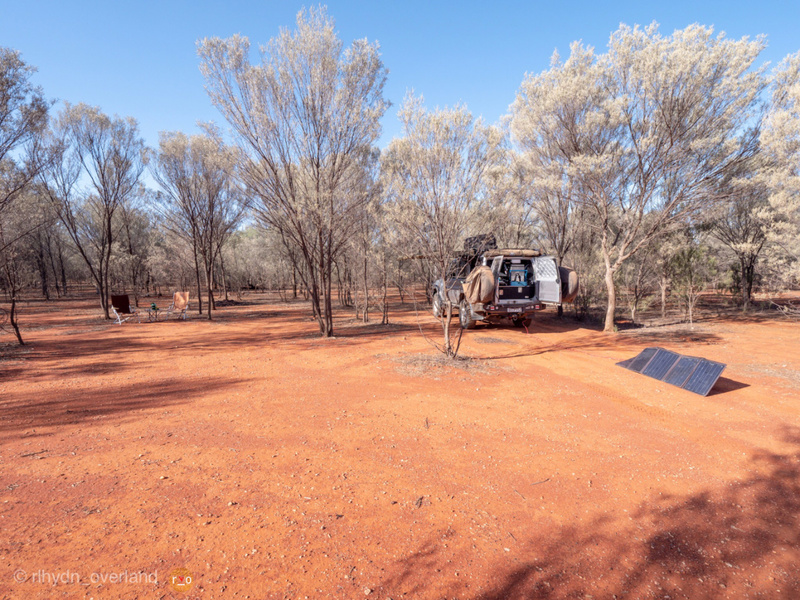 A superheated taste of touring in the space of an adventurous 2000km round trip. 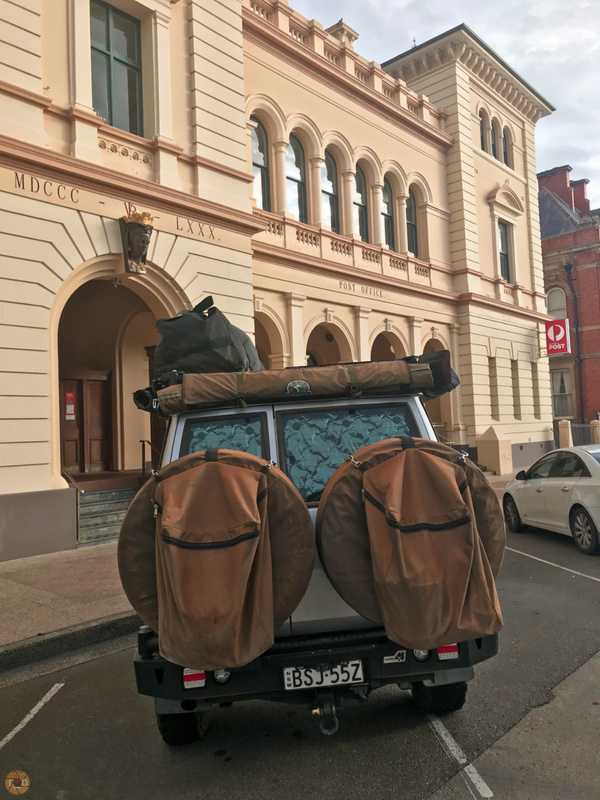 Bantering of the highlights, and ridiculousness of it all, we lazily ate dinner in Goulburn before spending a bonus hour stuck on the highway, the heat had ignited a truck (no injuries). We took turns interpreting truckie banter on the UHF for entertainment.